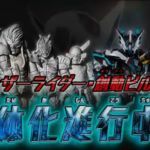 In case you missed it, Bandai announced the second set of Another Ride Watches was coming on the horizon, and since we initially posted that article, the pre-order link for Another Watch Vol 2 is now live. With that, we now have pricing, release info, along with the two previously unknown mystery Ride Watches revealed. 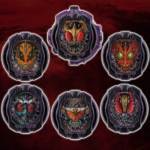 As many have speculated, the then-unknown Watches will belong to Another Ghost and Another Kuuga, in addition to Gaim, W, Den-O, and OOO. Another Watch Vol.2 will retail on P-Bandai’s website for 3,564 yen and will ship sometime in May 2019.